How do Knives Become Dull? Besides learning to sharpen, the best way to ensure your knives stay sharp is to avoid unnecessarily dulling them. Knives become dull in a number of ways, often due to misuse. For kitchen knives the most common reasons for dullness are: cutting on surfaces that are harder than the knife edge (ceramic plates, glass dishes, or marble/granite countertops) and storing the knife loose in a utensils drawer where the edge can bump into other utensils causing nicks and damage. Most dulling that occurs is a result of the very fine edge of the knife being rolled or folded over. If treated properly a good quality sharp knife may not require sharpening (with abrasives) for weeks, or even months depending on usage. We made the following video to explain dulling in more detail. There are a few easy ways to test whether your knife is sharp or not. If the knife in question is one you use regularly you will notice when cutting performance begins to drop off, this is a very good indicator of dullness. To get a rough idea of the state of the edge, view the cutting edge under a bright light. A sharp knife’s edge will reflect no light because the two sides of the knife come to a razor fine edge. Conversely, a dull knife’s edge will appear shiny because the two sides of the knife form a blunt rounded edge which reflects light. Another quick indicator is dragging a finger or thumb lightly across (as in perpendicular to the blade), a sharp edge feels grippy whereas a dull edge feels smooth. An easy cutting test can be performed using paper. Hold a piece of paper in one hand between thumb and index finger and lightly draw the knife across the edge of the paper, it should bite in and slice through the paper easily. If it slides off the edge of the paper or tears it instead, the knife is dull. In the video below, we demonstrate the concepts and tests mentioned above. All knives need maintenance occasionally; frequency will depend on the quality of the knife as well as its usage and treatment. There are two types of edge maintenance: sharpening (material removal with abrasives to re-establish an edge), and straightening or “honing”, (fixing a rolled over edge without removing much, if any, material). Of the two, straightening is necessary more often. Straightening is done with a honing steel. We recommend kitchen knife users have both a steel for regular edge straightening and an abrasive sharpening tool for occasional, thorough sharpenings. Alternatively, an abrasive steel (like the diamond or ceramic ones mentioned below) can be a good “all-in-one” solution if used frequently. Outdoor knife users should have a small tool, like a pocket stone or mini diamond rod, for touch-ups in the field and a main sharpening tool (such as a water stone or jig type sharpener described below) for thorough sharpening at home. What is a “honing steel”? A traditional “honing steel” is a very hard metal rod with a handle. 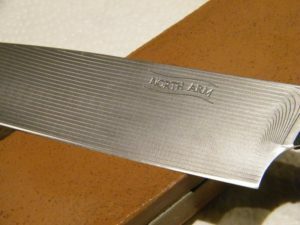 During normal knife use, the delicate cutting edge can get deformed or “rolled over.” The metal rod on a traditional honing steel is harder than the steel in knife blades and its primary job is to straighten up a rolled-over edge rather than abrading it to make the knife feel sharp again. For knives that are truly dull —not just rolled-over— a traditional honing steel will have no effect. However, honing steels are now made in many configurations besides the traditional smooth models: some have abrasive qualities as well, either file-like ridges along the steel rod or diamond coatings, some are even ceramic. These more aggressive versions not only straighten the edge but also remove a small amount of metal from it. Depending on its aggressiveness, it may be all you need to keep your knife sharp. Of all the types, we prefer and recommend the diamond and ceramic honing steels. “Steeling” only takes a few seconds but should be done fairly frequently. You can’t really steel the knife too often. Professional cooks will do it multiple times per day. For the home user, once or twice a week is generally fine. Think of it as preventative maintenance. If you touch up your knives before they are badly dull, they will stay sharp for a long time and maintenance will be easy. If on the other hand, you wait for weeks or months before steeling, letting the knife become very dull, you will probably get poor results when you do try to touch them up. To use a honing steel place its tip on a cutting board and hold it with the handle in the 12 o’clock position. Now bring the knife against the steel at approximately a 10-15 degree angle. Pull the knife down and across the steel from the heel to the tip while maintaining the angle. Next switch sides and repeat the process on the other edge of the knife. Repeat on each side of the edge, 5-10 times. For the first few strokes on each side use about 5 lbs (approximately 2.5 kg) of pressure (get a feel for this by holding the knife by the handle and push on a kitchen scale with the side of the blade until it reads 5 lbs.) The last few strokes should use successively lighter pressure. It is important to always use alternating strokes when steeling. A knife can not be steeled indefinitely, eventually it will require true sharpening. If the knife is still dull after 10 passes per side on the honing steel, it will generally require a thorough sharpening (metal removal). A steel is essential to proper maintenance for kitchen knives. There is no reason to pay more than $60 for a honing steel with many available for under $30. Even models which incorporate ceramic or diamond abrasive can be had for around $40 from a name brand such as eze-lap. For a home user, a good quality honing steel will basically last a lifetime. Note: Thin knives with very hard edges (over 60 HRC) may not be good candidates for steeling due to the chance of edge chipping (a steel places a lot of pressure against a very small part of the edge). Honing isn’t working. Now What? If a knife exhibits that shiny edge we mention above, in the testing sharpness section, and steeling doesn’t improve it, the knife is dull and needs abrasive sharpening. There are many tools to sharpen knives. They all work on the same basic principal, metal is removed from each side of the cutting edge until the two sides meet at a clean, sharp edge. Regardless of sharpening tool it is key to keep the sharpening angle consistent, some tools do this for you. Below we discuss a few common types of sharpening tools. Sharpening takes longer than steeling: depending on the method and degree of dullness, between 2-10 min per knife, but is not necessary very often if the knife is treated with care and steeled frequently. There are four variations on abrasive sharpening tools we recommend depending on what type of a user you are. The tools mentioned below should be available from kitchen or knife stores near you, and are easily available online. We recommend against using carbide pull through sharpeners. If you feel uncomfortable sharpening your own knives, please seek out a reputable sharpening service. This is probably the single most important concept in knife sharpening. If you get this wrong, you can have the best sharpener in the world and still have dull knives. The most common reason for knives not getting sharp is that you aren’t reaching right to the cutting edge with your sharpening. If you have tried sharpening knives in the past without success, this was likely your problem. That may sound really obvious but it is more subtle than you may think. The following information will help you avoid this mistake and it applies to any sharpener that sharpens one side of the blade at a time (and all the good ones do). The two main reasons why you may not be hitting the cutting edge with you sharpening are that you are sharpening at the wrong angle, or you are simply not spending enough time on one side before you switch sides/grits. Imagine each side of your knife’s cutting edge as a plane. On the majority of knives, these two planes are each tilted at around 10-15 degrees to make an overall (inclusive) edge angle of 20-30 degrees. When you sharpen, you want to sharpen at the same angle as those existing planes, to make them meet at a sharp edge. If your knife has an edge angle of 25 degrees you need to sharpen it at 25 degrees. If you are sharpening at only 20 degrees you are effectively not sharpening the knife’s edge. You would eventually change the knife’s edge from 25 to 20 degrees at which point it would be sharp. This is an unnecessary removal of material and may affect the performance of the knife. Sharpening the same knife at 25 degrees you will quickly achieve a sharp edge because your sharpening efforts are cleaning up the existing planes, instead of reshaping them to a different angle. The two planes will quickly be meeting cleanly again. The best way to check if your sharpening angle is correct is something called: the sharpie trick. Shade each side of the cutting edge with a permanent marker. Then proceed to a few strokes of sharpening per side. Check each edge to see where the shading has worn off. If the shading is gone above the cutting edge but still present at the cutting edge, the angle is too shallow. If most of the shading remains, but is worn off right at the cutting edge, the angle is a little steep. Ideally, the shading would wear off evenly right to the cutting edge. Provided you are sharpening at the correct angle, you must do so long enough to fully hit the cutting edge. The sharpie trick will get you close. Once all the sharpie appears to be gone, right to the cutting edge, there is a finer test you must do. You must check to see that your sharpening has created a burr on the opposite side of the edge from the one you’ve been sharpening. A burr is a small build up of steel along the edge. A fine “wiry” build up created by your sharpening and is the main indicator that you have sharpened all the way to the apex of the edge. It will feel like a tiny hook at the edge. You can check for it by feel with a finger or visually with a bright light. A q-tip can also be useful. Drag it across (not along) the opposite cutting edge; if a burr is present, it will snag on the fibers of the q-tip. Continue sharpening the same side of the knife until a burr is present along the entire edge! You may focus in the stubborn areas to speed up the process. Once a burr is present along the entire edge you have successfully sharpened that side of the knife. Next do a few alternating strokes on your sharpener of choice. This will break off the burr on the first side. If you don’t break off the first burr, it will simply “flip over when you start sharpening the second side and can easily fool you into thinking you’ve already achieved a burr on that side. Now sharpen the second side of the knife until you achieve a burr there too. With this done, do a few alternating strokes to finish. You are now finished the hard part. The knife is sharp! You may move to a finer grit to refine the edge further if you wish. Each grit after the first one should be easy and quick as you are simply removing the scratches of the previous grit. We plan to add an instructional video for this sharpener soon! This is our recommendation for those who want sharp knives without the learning curve of a manual sharpener. These cost a little more than some of our other recommendations below but will quickly pay for themselves in time savings and not having to pay someone else to sharpen your knives! They produce razor sharp edges with almost no learning curve. They make very dull knives sharp again quickly and do so without removing too much material or overheating the edge. If you have mostly german and american knives, get the 320 (20 degree angle). If you have mostly japanese knives, the 315 (15 degree angle) would be best. These basic models cost about $100-130 (CAD). The 1520 model has both 15 and 20 degree slots which gives you the best of both worlds, but you’ll pay a little extra, $200-230 (CAD) depending on the vendor. These sharpeners come with pretty good instructions, but we’ve outlined our recommended procedure below. Before you start sharpening, clean any residue or dirt off your knife. Do a quick sharpness test as described in the “testing sharpness” section above. If the knife is only a tiny bit dull, skip to step 10, to save time and avoid unnecessary metal removal. Otherwise, start at step 1 below. Color edge bevel with permanent marker. This will show you where the sharpening discs are contacting the blade. It also serves as an indicator of when you’ve sharpened all the way to the edge. Start with phase 1 (coarse). Gently lower the heel of the knife into the left or right slot. As soon as you hear the knife contact the sharpening disc, start pulling it through the slot towards the tip with very light pressure. Keep pulling until the knife exits the slot. Pull at a rate of about 0.5 to 0.8 seconds per inch of blade. For example, and 8″ long blade should be pulled through for 4-6 seconds. Don’t hold the knife tightly. Allow the angle guides to take care of setting the angle. After the first pass, examine the side you just sharpened. You will see shiny steel and no permanent marker in the area the sharpening disc touched. If the sharpening is already going all the way to the edge, do a couple more passes and then skip to step 8. If the sharpening is higher up the bevel, keep sharpening that side until you’ve sharpened all the way to the cutting edge. Feel or look for a minor burr at the cutting edge, it will be on the opposite side from where you are sharpening. If a slight burr is present along the whole edge, move to step 9. If not, try a few more passes and re-check. Repeat steps 3-8 on the second side (still using phase 1). The knife should now pass the “light test” we talk about it the testing sharpness section. It should also slice paper reasonably well. Move to phase 2 (the honing/polishing disc). Draw the knife through each slot 10 times. Then finish with 3 alternating passes per side. The knife should now slice paper easily. If it doesn’t try a few more passes on the honing slot. If that doesn’t help, go back to phase 1 and do a few alternating passes and then repeat step 12. V-style sharpeners (not to be confused with pull through sharpeners) are very simple to use and and can yield similar results to water stones. For those who are intimidated by the idea of sharpening, this is the tool for you. Almost anyone can use one of these successfully after watching a good instructional video. V-style sharpeners make the user’s life easy by holding the sharpening “stones” at the correct angle. All the user has to do is hold the knife perpendicular to the base of the sharpener (which is quite easy to do). A typical V-Sharpener is comprised of two or more abrasive rods and a base of some sort. The base has two angled holes in its surface for the rods to plug in to. Each hole is between 10-20 degrees from vertical (depending on the manufacturer) and set in mirror opposition to the other. When inserted in the holes the rods form the “V” shape that gives this family of sharpeners its name. Some of these sharpeners also have a second set of holes at a different angle, pick the angle which is closest to the angle of your knife edge without being less. The most common type of abrasive rods are coarse and fine ceramic, in some kits the coarse ceramic rods are replaced by diamond rods. A couple of popular models are the Spyderco “sharpmaker” (quality sharpener but on the expensive side) and Lansky’s “Turn box” kits (a very affordable option). All V-style sharpeners work on the same basic principals; Watch our video which demonstrates their use below. Still holding the knife perpendicular, slide it down the rod and pull it towards yourself so the whole cutting edge has contacted the rod by the time your stroke ends at the base. Repeat step 4 on the other rod to sharpen the other side of the cutting edge. check the edge of the knife to see if it feels sharp and reflects no light. If it seems sharp move on to step 8, if not repeat step 6 until sharp. For the technical user who is willing to put in some time to learn a new skill we recommend water stones as the best way to get a super fine edge; They offer the most versatility and control of all the sharpeners covered on this page, and in the right hands, will produce the best edge. The down side it there is a significant learning curve involved in becoming proficient at stone sharpening. Ideally a stone in the 800-1000 grit range is used to do the main sharpening and then a 3000-6000 grit stone is used for the final passes to bring the edge to a mirror finish. Combination stones with 800-1000 grit on one side and 4000-6000 on the other are available. Getting the angle right and learning to hold the knife steady at that angle is important to getting good results with water stones. It is simply a matter of practice but good results can be achieved relatively quickly. When buying water stones, buy name brand from a reputable source such as Lee Valley Tools. “King” stones are a good example of a quality Japanese made stone that is also very affordable. A combo stone will be your best bet to keep the cost down. For the average user a quality stone will last a lifetime. In the following video we cover a lot of subtle detail and the reasons why we do what we do. Below the video we also provide the written steps. You will probably find it helpful to look through both. Wet the stone(s) with clean water according to the manufacturer’s instructions. Ours are in water full time. Remove coarser stone from water and place on a stable surface. Orient the stone with one of the ends facing you. You may need to elevate a thin stone to create finger clearance above the working surface. Splash water on occasionally during use to keep the stone’s surface wet. Place the knife blade flat across the narrow dimension of the stone. Observe the gap between the cutting edge and the stone’s surface. Now, (pivoting the knife on the cutting edge) raise the spine of the knife until the gap disappears and cutting edge seems to mate seamlessly to the stone’s surface. Note how high the spine of the knife is above the stone at this point. This is the angle you want to sharpen at. Check this angle again as needed throughout the sharpening process. With practice you will have to do this less and less. Start the sharpening stroke with the cutting edge facing you, holding the knife in your dominant hand with the fingertips of your other hand on the flat of the blade. Regardless which side of the knife your are sharpening, all your strokes will involve pulling the edge over the stone rather than pushing it. Place the tip of the knife near the dominant-hand corner of the stone closest to you. Holding the knife at the angle we determined earlier slide it down and across the stone(diagonally away from yourself) in a smooth motion with medium pressure. The entire length of the cutting edge should contact the stone during each stroke. Now it is time to sharpen the other side of the cutting edge. Start the stroke with the cutting edge facing away from you and the tip in the dominant-hand corner furthest from you. Using the same angle (use the same trick to get the angle right) pull the knife towards you and diagonally across the stone mirroring the motion from the first side. Repeat step eleven 10-15 times. Next do 3-5 single strokes per side, alternating sides with each stroke. Check the blade for sharpness using the light test (described above), you should see no reflection from the edge. If the knife passes the light test move to the fine stone. If not repeat step 15 until it passes. Prepare your fine stone with water and orient in the same manner. Follow steps 3-15 on the this stone. Repeat steps 14 and 15 a second time. After the fine stone the knife should slice paper effortlessly as described in the “checking sharpness section” above. Well done videos…very thorough! I use a steel regularly, but still learned a lot from the detailed examples. As well, I previously knew little of the sharpening tools or how to use them.